Tales from Space: Mutant Blobs Attack was the first game I ever loved on PlayStation Vita. It was a charming, smart little game with a distinctive art style that looked dynamite on the new portable's expansive screen. It's fitting, then, that its creator, DrinkBox Studios, has returned with what I suspect may be the last Vita title I'll ever love: Severed. Following up on the stellar Guacamelee, DrinkBox has developed a game with a deceptive outer simplicity that hides miles of depth for those who slice below the surface. You are Sasha, a one-armed woman on a quest to rescue her family from what appears to be some sort of purgatory. Though the young warrior may be missing a hand, she's far from unarmed. She protects herself with a large blade controlled via swipes on the touchscreen. That may sound like the setup for an iPhone game, but Severed methodically layers on new systems until it arrives at a level of depth that would put many action games to shame. In the one-on-one combat scenarios, you must swipe the screen to strike enemies, aiming for weak points or attempting to parry their incoming strikes. What makes Severed really thrilling, though, is the fact that you are almost always surrounded, and must contend with several different enemies at once, each with their own attack patterns and weaknesses. This piling on of attackers turns combat into a time management puzzle. You must watch the timers that surround Sasha and be prepared to counter when an enemy strikes. Some enemies can't be countered, and must be attacked at regular intervals to keep their bites and blasts from decimating Sasha's health meter. Battles in Severed are all about rhythm — learning how long it's safe to let enemies stew without a slice — and choices. Do you pop off a few cuts to keep the eyeball from blasting, or do you try to kill the cluster of bats so you can stop worrying about their attacks? It's immensely satisfying to fall into a groove, but that groove is slightly different with every battle. The complexity continues to be ratcheted up with magic spells and charge attacks. Most notable, however, is how the hero of Severed upgrades her arsenal. Sasha builds focus over the course of a battle, and if the meter is full by the time she kills an enemy, time freezes and she can lop off her opponents' limbs and use them as upgrade materials. This is fun on the visceral level of "hey, I cut your claw off, jerkwad," but it adds the most vexing strategic layer: If you kill enemies before the focus bar fills, they simply die and you lose the chance to harvest their appendages. You'll be trying to keep enemies alive while defending yourself almost as frequently as you'll be trying to kill them. A warning: This may not be the best Vita game to play in public. I rubbed my fingers to the nub, frequently hammering on the screen with the manic intensity of a lottery addict convinced their next big score is just a few tickets away. The physical act of playing Severed is actually the game's biggest issue. The Vita is a relatively heavy portable, and holding the system with one hand while slashing with the other, while not immediately taxing, did start to get a little fatiguing by the end of my six or so hours with the game. Admittedly, most people probably won't finish the game in two sittings like I did. I realize this has been a bit of a mechanical deep dive, but Severed deserves the scrutiny. It may be working with some pre-established mechanics, but the way in which it blends them is incredibly addictive and rich. Severed is one of those games where the moment I finished playing it, I wanted to fire it right back up again. I probably would have, too, if I hadn't needed a few minutes to digest the final moments of the game's simply told yet profoundly moving story, about furiously battling with and coping with loss. Severed is light on dialogue — Sasha encounters only a handful of underworld denizens, none of which are overly chatty — which makes the emotional effect all the more impressive. DrinkBox smartly uses clean visuals to make Severed's story even more universal and haunting. The studio has a rich history of simple graphics beautifully rendered, and Severed is the strongest iteration of DrinkBox's aesthetic to date. The game has been rendered in blocky, vibrant colors that look like decorations from an ancient Aztec nightclub. Married with the game's ethereal setting, the world of Severed takes on a haunting, otherworldly quality. 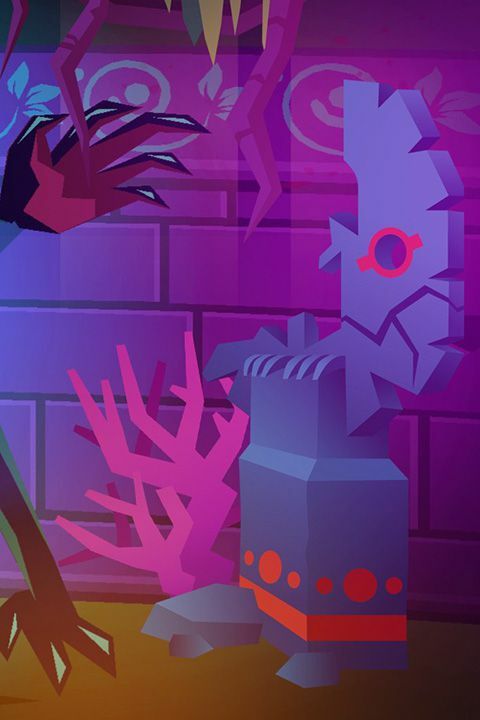 Severed was reviewed using a pre-release "final" PlayStation Vita download code provided by DrinkBox. You can find additional information about Polygon's ethics policy here.